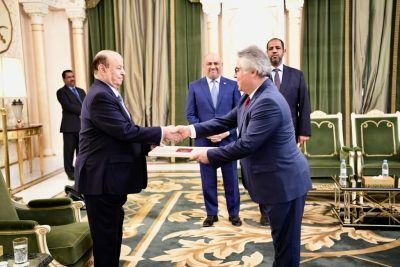 President Abd-Rabbu Mansour Hadi received Sunday credential documents of a number of newly appointed Ambassadors of friendly countries to Yemen. He received credential papers of Adnan Olentou as Ambassador of Republic of Philippine, John Gerard Muckory as Ambassador of Ireland Republic, Yurari Kodelka as Ambassador of Czech Republic, Auntie Rotvori as Ambassador of Finland and Farouk Boz Ghuz as Ambassador of Republic of Turkey. Following the ceremonies, President Hadi met separately with each Ambassador, welcoming them, promising all necessary support to enable them doing their missions. Hadi briefed the newly appointed diplomats on the latest developments about the circumstances Yemen has been going through and underway efforts to establish peace. 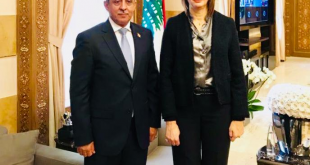 Foreign Minister Khaled Alyemany, Director of the Office of the Republic Presidency and Chief of Presidential Ceremonies Mohammed Haj Muhfouz were in presence.